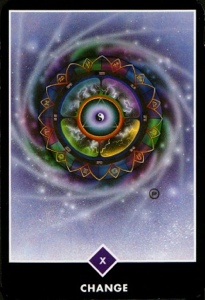 This card is the Wheel of Fortune from the Osho oracle deck. The Wheel of Fortune represents change. It may represent that your situation or circumstances are about to change. As I moved closer to 40, I kept getting the sense my life would change. My daughter would be on her way to college and I was going to start the next chapter of my journey. Right before my 40th birthday I experienced a MAJOR shift in my life. While I knew this shift would come, I was NOT ready!! I fought tooth and nail and went down kicking and screaming. Change is inevitable. Not all change is bad. Sometimes you are forced to make a change because wherever you are or whatever you are doing, may no longer serve your highest good. I’m a Taurus and by nature, we don’t like change. I especially don’t like change when I am quite damn comfortable where I am doing whatever I am doing, even if the change is necessary. When you are transitioning through life to the next level, the transition can be uncomfortable. Rather than resist and fight it, making the transition unbearable, embrace the change with open arms. You may be surprised to find that your unexpected change has lead you to new experiences and or new opportunities. Going through some life changes? Looking for your life purpose or path? Give a holistic life coach a try. For more information visit NUBODIor email info@nu-bodi.com.